Many children don’t have the critical literacy skills they need to survive and thrive in a digital world. Through NewsWise, we help teachers empower pupils to access, understand, analyse and participate in the news. NewsWise is free for schools and provides teachers with a suite of curriculum-based lesson plans, online resources, exciting school workshops and opportunities to speak to real journalists. Funded by Google, we have developed NewsWise in partnership with the Guardian Foundation and the PSHE Association. Find out more about NewsWise. We are running training sessions for teachers in the spring term to develop critical literacy skills in the classroom and build reading and writing outcomes. There are a suite of free NewsWise resources available for teachers to download. Download all the lesson plans and resources for the NewsWise unit of work. Use this teacher guide to help you make the most of the NewsWise unit of work. Download the NewsWise values poster to display in your classroom. 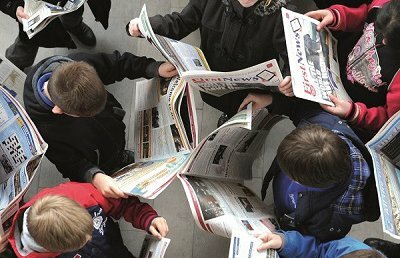 Help your pupils navigate the news with this tool to use in the classroom and at home. Add authenticity to news literacy lessons with these tips on how to turn your classroom into a newsroom. Suggestions and links for reading and understanding the news with your family. Today’s children are growing up in a globalised world and are processing information from a wider range of sources than ever before. To navigate the potential pitfalls of consuming news, particularly online and on social media, children need strong critical literacy skills. Despite these skills being taught at every stage of school life, our research shows that children and young people in England simply don’t have the critical literacy skills they need to identify fake news and thrive in a digital world.